Del Kathryn Barton has laboured meticulously over her mark making in 'Come of things', with every stroke, dot and run of paint counting in the final composition. The attention to detail almost overwhelms the subject matter, as paint and image merge into and emerge from each other across the surface of the canvas. An unashamed attention to the decorative is typical of Barton’s practice, tracing a lineage to the reclaiming of women’s domestic craft in some feminist practices as well as to contemporary fashion and design. 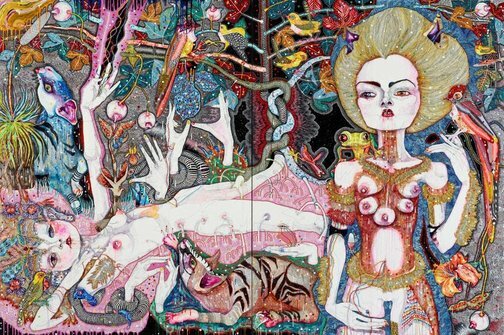 In Barton’s work while the decorative may also be feminine, it is entangled in a dense skein of psycho-sexual impulses which weave through the visual elements of her work. 'Come of things' depicts an almost primordial scene in which glistening plants, beautifully groomed creatures and woodsprite-like figures which could be male or female suggest a fusion of creativity, nature and art. The paintings from the series to which this belongs seem to embody a moment where nature and humankind are deeply embedded rather than alienated, a vision utopian in its fecund abundance but also disturbing in its overripe and undefined eroticism. 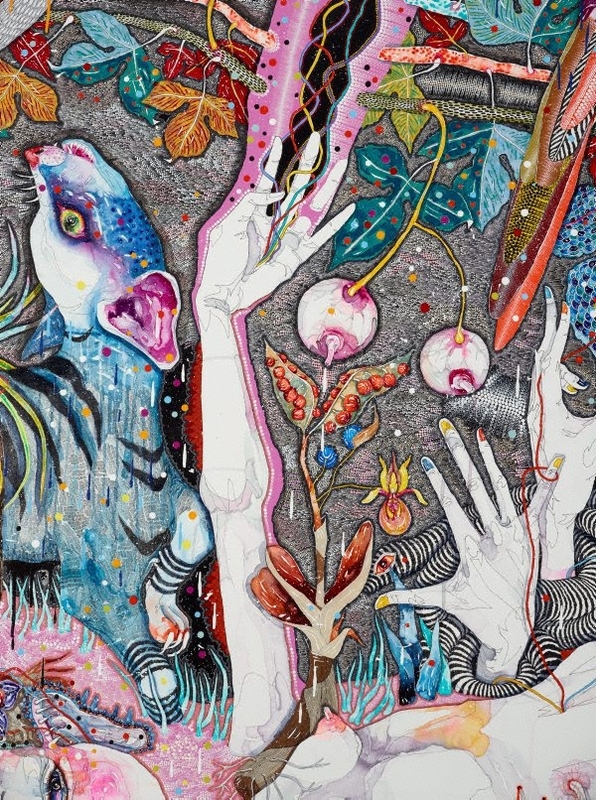 Figures and creatures are literally rooted into their environment, with tendrils and vines growing from and entwining sexual organs and the surrounding nature. 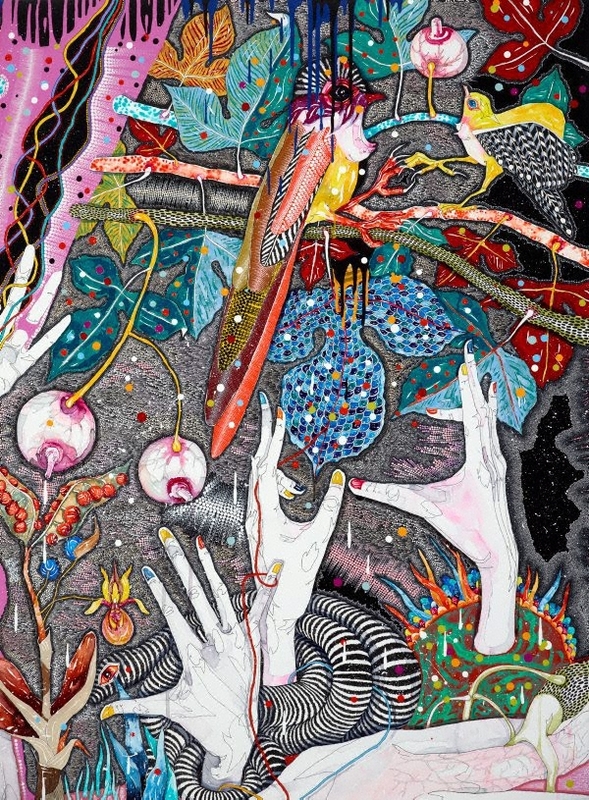 The detailed abundance of paint and fecund imagery have something in common with the obssessiveness and at times disturbing subject matter of outsider art, but the deliberate beauty of Barton's work beguiles more than it unsettles. 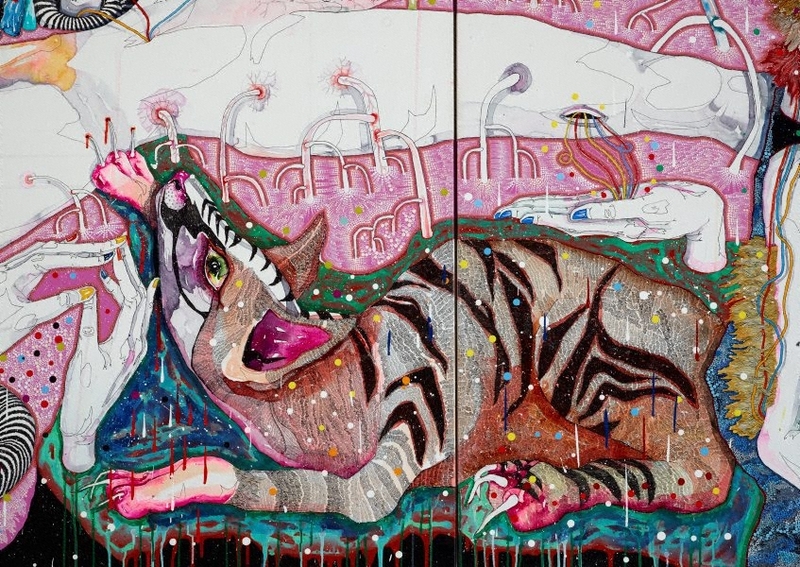 We too are lead into this realm of multi-breasted hermaphrodites, glittering birds and richly furred animals, a place which seems to have its own visual and sexual logic. The decadence of these images also recalls the work of late 19th and early 20th century symbolists, an art movement in which colour and paint existed as much for their own glittering, decaying effects as for what they could represent. Wayne Tunnicliffe, Look , 'Latest Contempo purchase for the Gallery', pg.12-13, Sydney, Sep 2010, 12-13 (colour illus. ).